Alice J. Cammiso’s new book “A Smile and a Wink a Book of Silly Limericks about the Stick People” is an imaginative and amusing look at some of the country’s top issues. Recent release “A Smile and a Wink a Book of Silly Limericks about the Stick People” from Page Publishing author Alice J. Cammiso is an original work that is sure to leave a smile on all readers. 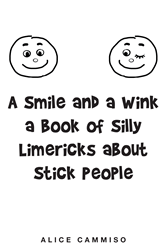 Alice J. Cammiso, a passionate and imaginative author, has completed her new book “A Smile and a Wink a Book of Silly Limericks about the Stick People”: a fun easy read that is guaranteed to put the reader in a better mood. Alice J. Cammiso was born and raised in Brooklyn, New York. She now lives in suburban Merrick on New York's Long Island. Published by New York City-based Page Publishing, Alice J. Cammiso’s creative tale combines the fun of limericks and stick people with current topics to make a book that is sure to please. Alice J. Cammiso has written a book that deals with our country's complicated issues. A provocative book that makes readers smile while conjuring up deep thought. Her observations are captured and reflected in this book. Readers who wish to experience this whimsical work can purchase “A Smile and a Wink a Book of Silly Limericks about the Stick People” at bookstores everywhere, or online at the Apple iTunes store, Amazon, Google Play or Barnes and Noble.